*3 Extras, $140 Values! $50 SA8501 Deluxe Padded Case, $30 for Organ Box of 100 HAx15x1 Needles, $60 for 12 Spools of 3000 Yard Cone Poly Serger Threads, CD Video in Box. Made in TAIWAN (same as Brother 1134DW, 3034D). Gail , the belt can only slip off the hand wheel in shipping, not in operation.. Lay the machine on its back, remove the 4 screws and bottom plastic cover, then remove 2 screws on the right hand plastic cover around the handwheel, remove the 1 screw in presser foot lever so the cover will come off, put the belt back on the hand wheel first, then onto the motor pulley. Reassemble. The only tool you will need is a phillips screwdriver. John, Thank you so very much! My husband followed your directions this evening and as you thought, the belt was the problem. After putting the belt back on, it was very loose, so David moved the motor to tauten the belt. My serger is now working like a charm, and I am very happy. What a nice machine! Thanks again for your expertise and using email for me. ....Gail B. The 2-thread stitch is for overcasting a single layer of fabric. It does not have the seam, only the overcast. Of course, you can overcast with the 3 or 4 thread stitches as well. I am extremely pleased with my choice to purchase from Allbrands! I have purchased from you before and was very pleased as well. Keep up the good work!!! I wanted you to know how happy I am with my serger. I love my Brother Serger!! It is perfect!! And you all got it to me sooo fast!!! Everything is great. Thank you!!! I can always find exactly what I am looking for at Allbrands. My shipment was here within a couple of days. Keep up the good work. This is my second order from AllBrands and I highly recommend it to all my friends! I will continue to do business with all brands for all my major purchases. The last Brother sewing machine I ordered took seven days though. :( Thanks so much for your site. After buying my serger and being so excited, I got home and thought, "now what"? I have never used a serger before. Opening the box, I was very happy to see there was a video with it to show the basics. That was 5 years ago. It still works like new, and I am still learning more every time I use it, but I am able to use it. It didn't take long to learn. The Brother 925D can be used as a 3 or 4 thread machine. Threading it is very simple. Everything is color coded to let you know where the string goes next. It also has a feature that you can shut off to cut the excess fabric as it sews it. I sew everything I can now. Not just quilts, but clothing and household things as well. With my serger, it gives it a professional look. The biggest plus of all would have to be the price. I would recommend this machine for anyone that is just learning to use a serger. 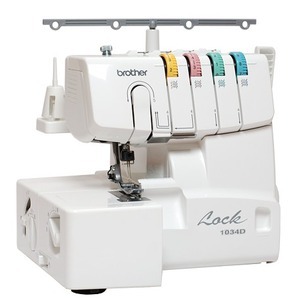 I purchased a Brother 925D Lock serger over 2 years ago! My main motivation was the price! (A very reasonable 279.00!) This machine has been through the trenches for me and has come out going strong!! 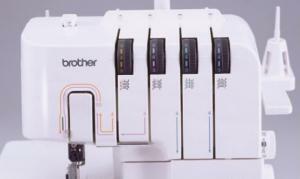 The Brother 925D has many features that I took for granted before I saw many other sergers. The threading is color coded and a piece of cake! The tensions have a lay in thread guide for those needing the "Serging for Dummies" course! It also has an outstanding feature which involves the lower looper threading. 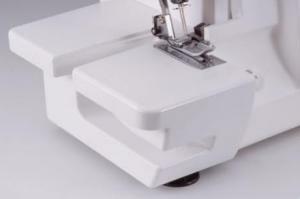 Most sergers require the side plate to be completely removed for the delicate process of lower looper threading. This machine has a great finger, that enables you to set the looper thread in a little hook and push it into place. This basic Brother also has a front plate that swings down for ease of threading and cleaning. It features differential feed, lots of stitch length and width settings, and a convenient knob to turn down your knife. It comes with a video and instruction book that shows you how to make the most of the machine. Techniques includes blind hem, rolled hem, flatlocking, and elastic application, to name a few. It is a good machine at a great price. I would definately recommend it for any home seamstress, especially those who are unfamiliar with sergers. I will continue to sew with mine! It is exremely easy to use, and reliable for moderate use.